This book was sent to me a fortnight or so ago by possibly the nicest author in the entire world. That hasn’t affected my review in any way at all, but I just thought it was worth mentioning – everybody likes friendly author e-mails in their inbox! Dolphin culture evolved over millions of years so they could remain perfectly attuned with their world, Ocean. Unlike man, they have created an almost utopian society without feeling the need to manipulate their environment, collect possessions or wage war. But the growing pressure of man’s activities become intolerable and in frustration one faction seeks an aggressive new path, making a shocking departure from The Way – the ancient philosophy that has guided them so well through the millennia. Sky, a male dolphin close to becoming an Initiate in The Way, unwillingly finds himself caught up in the violent consequences. To save the lives of his closest friends he will have to risk the worst punishment his clan can inflict and must decide between the two females who challenge everything he believes in. I wasn’t entirely sure what kind of book this was going to be when it first landed on my doorstep. Obviously Mr. Caney had told me the basic gist of the story, but it’s such a unique concept it kind of has to be seen to be believed. I saw a review somewhere that labelled it as a kind of Watership Down with dolphins and now that I’ve read the book, I’m whole-heartedly in agreement. It’s just as beautiful, moving and horrifying as the rabbit book (which to this day I’m too scared to reread) but deals with the more identifiable environmental threats instead of Facism and Communism. To cut a long story short, a small group of dolphins have distanced themselves from traditional society and formed The Guardians – an elite group who belive in preserving the welfare of the dolphins (or zetii, as they are here) whatever the cost, even if it contradicts The Way. This creed has been passed down for generations and completely forbids the killing of animals for sport or amusement. In the midst of this upheaval Touches the Sky and his best friend, Muddy River Mouth, happen across the body of a murdered female dolphin and are swept into a kind of Civil War with horrifying consequences. 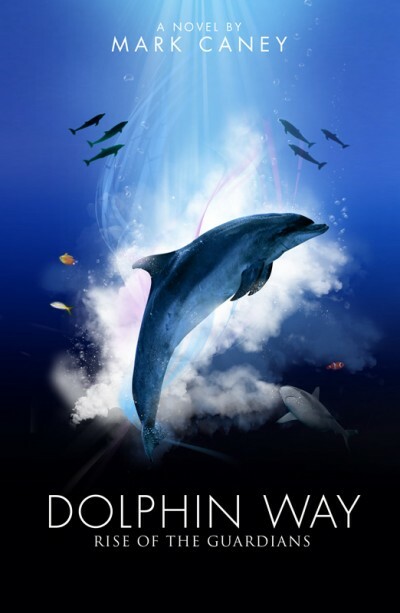 What particularly impressed me about Dolphin Way: Rise of the Guardians is the amount of effort that has clearly gone into the creation of the dolphin world. Well, not ‘creation’ exactly because hey, it’s the ocean but it’s wonderful regardless. Mark is an accomplished diver himself and it shows. Just to put it into perspective, I’m absolutely terrified of fish and I still immediately wanted to go deep-sea diving to see these wonders myself. The entire dolphin society and belief system is so well explained that it seems like it could easily be real. It makes perfect sense that their community would be growing more and more frustrated with our own poisonous activities and eventually a group of extremists would decide to take matters into their own hands. After all, is it that different from what happened in our own world? My ultimate favourite thing about Rise of the Guardians was the classes young dolphins are made to attend to learn how to blow bubble rings, control their breathing and other essentials for day-to-day dolphin survival. I just felt that it lightened up the book a little. I’m not saying that it’s a heavy, preachy book; far from it, but it does deal with some weighty issues so it was nice to have a bit of fun thrown in here and there. Muddy was amusing most of the time too. My only minor gripe was that the romantic sub-plot didn’t really seem all that necessary, but then I say that about every book I read so you might not want to take me too seriously. I just think that the plot and issues were perfectly self-sustaining and didn’t really need anything else to carry them along. It seemed to clunk down the otherwise flowing storyline a little. Before I picked it up, I was a little worried that it would come across as a bit silly as anthropomorphic novels occasionally do. It doesn’t. Not at all. It’s very, very well written. You do need to give it your whole attention because I wouldn’t say it’s a particularly easy read, but the beautiful prose makes it more than worthwhile. Mark’s website here can explain the book a lot better than I ever could. Drop by and learn something! I'm having an odd morning.. I found the "I'm absolutely terrified of fish" part absolutely hilarious. Dan thinks I'm on a caffeine high. Maybe, maybe.. Need to get serious to write. I'm at the end of the story and I'm about to write a sad part. *deep breath* Right.